I came across a new (to me) “band” quite by accident the other week. 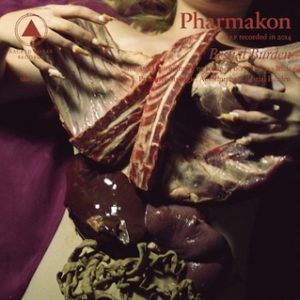 The “band” (which I later found out is the solo project of Margaret Chardiet) is called Pharmakon. As so often happens with amazingly different music, it was the album artwork that caught my eye and drew me in before I had heard a single note (or the opposite of a note, as the case may be). Such was the case when I first discovered Björk, when the album cover of Homogenic literally stopped me in my tracks walking down the aisle of a Gallery of Sound record shop. (Back in the day, when we bought music in stores). The album was inspired by the experiences Chardiet had during surgery. This meshes in deliciously with the artwork, which shows a girl (I’m guessing Chardiet), laying down with cuts of meat and offal laid across her body to suggest her internal organs. If you know me, you know how seriously I take my own album artwork – that it must be an extension of the overall work. Learning the inspiration for the album, I was drawn in even deeper accompanied by a tremendous amount of artistic respect. The album starts with “Vacuum,” breathing to a background of electrical humming… breathing which soon becomes layered, altering the patterns in an intense trance-like way. The breathing ends – sooner than expected – and the next track, “Intent or Instinct” emerges with NIИ-esque noise and beats. Chardiet’s vocals, emerging from the background as subtle instrumentation lead up to primal screams that would make Diamanda Galas droll in envy. The second track seams itself in beautifully with “Body Betrays Itself,” which for me invokes the soundtrack to House of 1,000 Corpses. “Primitive Struggle” starts off with a person coughing, retching and panting as the beat behind intensifies. This instantly took me to the sound-design tracks of Type O Negative’s World Coming Down – one of my favourite albums of all time. A clean break in the noise atmosphere introduces “Autoimmune.” This is the first track on the album where I can sort of make out lyrics – which is by no means an insult. “Autoimmune” ends followed by a brief, clean break of silence that makes you appreciate just how engulfed you were in the atmosphere. The album’s false ending is its title track, “Bestial Burden,” which returns to an invocation of Diamanda Galas, but with Chardiet’s own distinct flavour, which by this point has been well established. This track brings you an onslaught of maniacal laughter, layered until it becomes instrumentation in its own right. Who doesn’t love a bonus track? I adore them!! And here we have a surprise version of “Bang Bang (My Baby Shot Me Down),” which is originally a Cher song written by Sonny Bono. It’s a damned good version! I reference other bands and artists in this post…. but they are merely anchor points to what is otherwise an incredibly unique album. Yes, it’s another noise album, but for as much as I love noise, most noise album do become tedious after awhile. One can only take so much in one sitting. (The same goes for my own albums, which are blessedly short). Music that really drives itself under your skin and challenges your perception usually does become tiresome, simply because it requires more of you – the listener – than being a passive audience member. At 32:40, I find the album length of Bestial Burden to be absolutely perfect and brilliantly planned. Bestial Burden is available on bandcamp. To hear some of my own experimental tracks simply enter your name and email address here for a free download.